Recently one of our customer asked how to find cases or emails created on Saturday/Sunday or cases created after normal working hours (i.e. after 18 PM?). Of course this CRM system had email router which were creating those email and automatic case were created based on this. I did try to so this using advanced find but it is not possible to get the desired result and try to do this using Excel features and it was really easy, following quick steps for the same using Excel. Step 1: Export data to excel, so do advanced find on CRM (CRM 4.0 or CRM 2011) to retrieve relevant data and then export that to excel. Step 2: once exported add new columns, let’s say those columns are called “DAY”, “Time HOUR” and “Time MIN”. Step 3: put formula to retrieve values for those columns, as shown below. Please note that column G is created on date and based on this column G following formula are created. Please change column name as per your requirement. Step 4: after apply this formula to all rows and you will get following result. Step 5: you can apply standard excel filter to return only cases created on weekends (Saturday/Sunday) or cases created after 18 PM easily. This entry was posted in CRM 2011, CRM 4.0, Tips & Tricks and tagged automatic case, CRM 2011, CRM 4.0, crm system, Tips & Tricks on June 27, 2012 by mayankp. Last Month, I was honoured to receive recognition by Microsoft for contributions to the Microsoft online technical communities with the Microsoft Community Contributor Award. Thanks Microsoft and to you who nominated me! 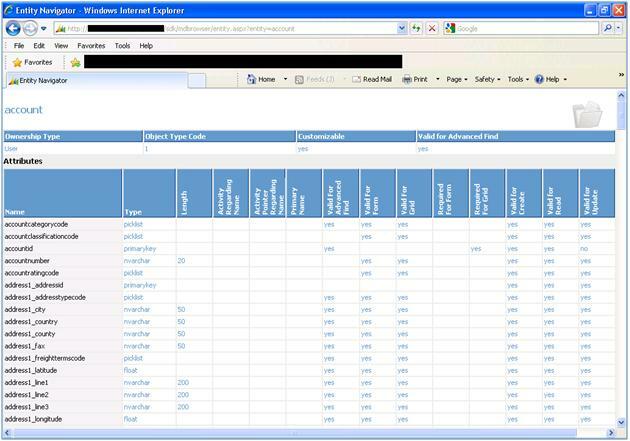 This entry was posted in CRM 4.0 and tagged CRM 4.0, Presentation on April 19, 2011 by mayankp. While working with CRM sometimes we get following exception screen with this message, which means there is some exception or issue on this operation. Try this action again. If the problem continues, check the Microsoft Dynamics CRM Community for solution or contact your organisation’s Microsoft Dynamics CRM Administrator. Finally you can contact Microsoft Support. Following methods will help you crack down the real cause of this exception or error.  And check application event log and find the relevant log and this will have actual exception details regarding this problem.  Open the Web.config file.  Look for the DevErrors key, and change its value to On.  Save the Web.config file. 	Go to tracing folder and open log file and locate the exception related to your operation. Of course after finding actual cause of the exception solution will really different for each exception but above troubleshooting method will help you get in to right direction to fix any dynamic CRM issue. 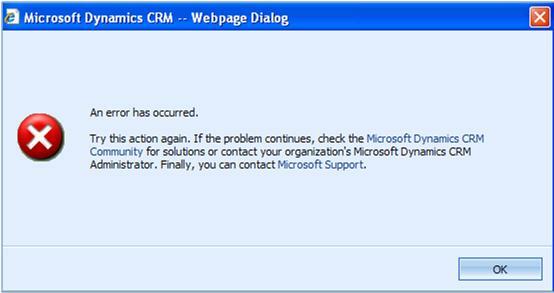 This entry was posted in CRM 4.0, Error, Tips & Tricks and tagged CRM 4.0, Error on September 11, 2010 by mayankp. This could be due to many reasons but one of reason for slowness is auto tagging incoming emails, CRM 4.0 by default processes 1000 emails in outlook inbox. These settings can be altered by creating registry key on client side and if you change this value to around 20 and this should improve performance considerably because now CRM tagging engine will look for last 20 emails that came in to outlook rather last 1000. Following is registry key settings which needs to be altered for the same.. The value in this registry entry sets the minimum number of items that the auto-tagging feature will process in the crawl mode. When a folder contains fewer items than the value in the registry entry, the auto-tagging feature will process items in the search mode. The default value is 1,000. The value in this registry entry sets the maximum number of items that the auto-tagging feature will process in the crawl mode in a particular folder. The default value is 1,000. 1. On Client System, Click Start, click Run, type regedit, and then click OK.
3. To create a new registry entry, right-click MSCRMClient, point to New, and then click DWORD Value. 4. Change the name of the registry entry to TagMinItemsForCrawl and set value as 0. 5. Similarly create new registry entry TagAllowedItemsForCrawl and set value to 25. 6. Restart Client outlook . This entry was posted in CRM 4.0 and tagged CRM 4.0, performance on September 1, 2010 by mayankp. Replace servername, portname and organization name of your environment in above link. 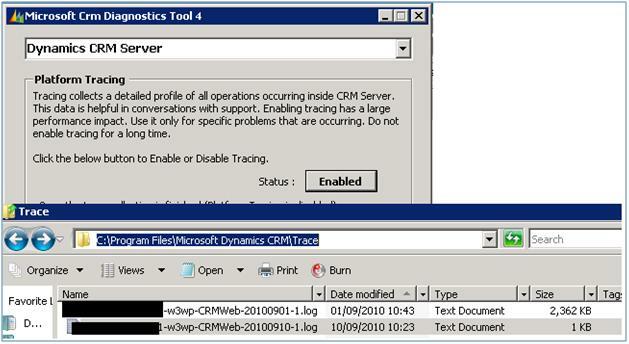 This entry was posted in CRM 4.0, Tips & Tricks and tagged CRM 4.0, Customization, Tips & Tricks on August 22, 2010 by mayankp.